Remembering Film Institute Days: Shooting of "VIDYARTHIKALE ITHILE ITHILE"
Shooting of "VIDYARTHIKALE ITHILE ITHILE"
After our classes were over at the Institute my self and Kasturi R Murthy traveled by train to Madras to take up our first feature film assignment. Since Murthy had some relatives at Madras, he preferred staying with them. I joined John and Azad at their office at 49, Wallajah Road and was accommodated there for the time being. We did not have a separate room for ourselves and spent the day amongst the office staff and at night, we all slept in the settee and carpet in Producer Minnal's air conditioned cabin. In the hot and humid climate of Madras the air-conditioning was really a luxury. There was a nearby "Nair's Mess" at Triplicane which provided tasty Kerala type meals at very low prices. It was a small place and was always crowded and you have to wait for some time to manage a seat. The food and accommodation was quite comfortable. As I was a novice in the Madras film Industry I had to learn many things about the procedures and working methods there. At the Institute you had all the equipments at your disposal and all you have to do is to write the list in the register and take them for the shooting. But here the equipments had to be hired from rental companies. Since Azad had worked in a few P.N.Menon films, he took me to Sujatha Movietone Unit, whom he said charge reasonably and had good workers. The camera we wanted was Arri IIC with option to use blimp as John wanted to use location sound recording. But the compact and portable Nagra recorder was not available at Madras as it was not considered a "Professional" equipment by the sound recordists there. Because of its small size and 1/4 inch tape they thought that it will create sync problems in lengthy shots. P.Devadas an alumni of the Institute who was at that time was with Chitralekha Film Co-operative Studio founded by Adoor Gopalakrishnan was contacted and he joined us with his Nagra equipment to do the sound recording. We had planned to do our shooting in real houses instead of the usual practice of using studio sets using the household power supply. But to match the indoor light with the bright sunny out door light required the use of more powerful lights, such as 5KW or 10 KW. We could not use them as they would consume more power and the house connection will not take up such heavy electrical load. Generators were rare and very expensive too; hence locations with 3 phase power supply were only selected if additional lighting is required. Apart from the usual Junior and Baby lights I asked for Colortron (USA) lights which I have used at the Institute and are known to give much brighter light out put. To my surprise I was given a Bombay made light which had a sealed beam spot light whose intensity can be varied step by step using a transformer and they called it "Colortran" light! Since it always produced a hot spot I asked for a few white boards to be made for bouncing the lights. Having been brought up in Tamil Nadu, I haven't seen many Malayalam films. I have seen a few of them while we went to Kerala on summer holidays to my parent's place. I had seen Ramu Kariat's CHEMMEEN at Madras and P.N.Menon's KUTIYEDATHI ( Starring Jayabharathi ) and few other Malayalam films at the Institute. In fact I have never even witnessed the shooting of a Malayalam film either before I ventured into the film industry as Cameraman. We were using ORWO Black and white negative film as Kodak film was much expensive and also hard to get and required and import licence. 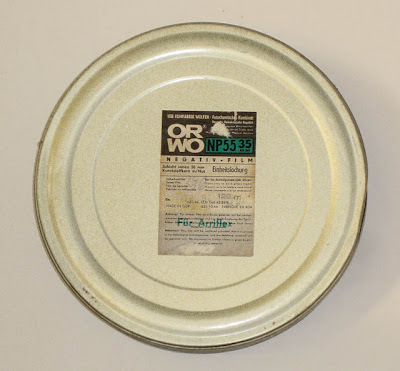 Since ORWO film was manufactured in Communist East Germany and was imported against Rupee payment it was freely available and cheaper than Kodak film. ORWO negative was available in two speeds, ORWO NP55 which was 64 ASA and ORWO NP27 which was 400 ASA but rated as 320 ASA.I used the faster NP 27 stock for indoor filming and the slower NP 55 for the out doors. Since we had white walls all around I did the lighting by bouncing a few units on the ceiling, the walls and on the white boards to get a soft day light effect. I started the first day of my cinematographic career by taking a close up shot of Malayalam Actress Jayabharathi at a small house in CIT colony in T.Nagar. The scene we had to shoot was her interaction in the role of a school teacher with a few children, who were playing their role of her students. After the day’s shooting was over Jayabharathi called the Producer aside and expressed doubts whether some image will be recorded on the film as this novice cameraman had not put any light on my face. Instead he had focused the lights everywhere on the walls, ceiling, boards etc except my face. Having been used to the hot direct spot lights hitting her face in studio floors, it was but natural for her to think like that. Also I was very young (hardly 23 years old) thin and still not out of the Institute and an inexperienced hand. Having heard this doubtful remark from the Leading lady the Producer also started worrying about the results. The next day I got a call from the Vijaya- Vauhini Laboratories asking me to meet the Laboratory Chief Mr. Sen Gupta. The reason was they were getting only blank film when they processed the test negative. In those days a 5 ft Test shot close up of a face is taken either in the beginning or at the end of the roll which will be processed first and after checking the density the duration of the processing is adjusted accordingly. Under exposed negatives will be brought up to required density by processing for more duration and over exposed ones for lesser time to obtain a uniform density final negative. Usually the density of the negative image is visually checked by experienced personnel and may vary from person to person. Also there will be a variation of the skin tone of the actor in the close up. In order to overcome this I took a Test shot of 18% grey card (considered to be equivalent average skin tone) and asked them to develop it and measure the density in the Densitometer and keep it as standard for the processing. It was the grey card that they found instead of the close up and that created the confusion. The Laboratory Chief Mr. Sen Gupta agreed to my contention but requested me to have the face close up as test since the Lab technicians over the years are used to that practice. Finally when the rushes were printed and projected in the Lab theatre all anxieties vanished and the producer and the Director were fully satisfied with the results. 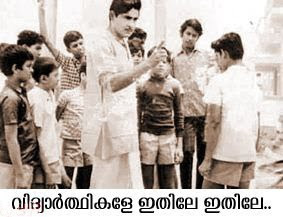 Madhu who had by then been well known all over India for his role in CHEMMEEN was the leading actor in our film. On his first day in our set, unfamiliar with the formalities existing in Malayalam film industry I addressed him as "Mr.Madhu". He turned and gave a piercing look at me, a thin young man of only 23 years for calling a top hero like him in this manner. I noticed it and continued " Please come and stand in position for the lighting". He understood the nature of the Institute bred people as he himself was the product of National School of Drama and willingly came and stood in his mark for me to adjust the lighting. Later on I found everybody else on the sets were addressing him as "Madhu Sir" and I too followed it! We continued our shooting in that house location and also in the streets of Madras for a few days. We shifted to a flat at Mahalingapuram which functioned as our production office as well as our residence and guest house. In the meantime the dates of our Viva Voce examination at Poona were intimated to us. So, during a break in the schedule myself and Murthy left for Poona. Its wonderful peice sir. I especially liked the part when the Lab guys contacted you for the blank negative and the reaction of the actress. It is so nice to read from a great established cinmatographer like you. Thank you Sir. When I first took my panning shots, of a bull race with my Nikon 801S, the lab called me to say they couldnt beleive I wasted my film, as the negatives are all looking 'shaky'. They were only used to typical f/60 and 5.6 shots of Marriage photographers. Few of the shots from that negatives actually got me some acclaim and was also sold/used well. Many photographers had similar experiences with labs when they try to create some thing new and the labs who are used to regular run of the mill products are bound to think that some thing was wrong with the camera or a cameraman! Nice Blogs and this post is really nice and interested to read. Thanks for sharing this type of postings. Sir, is it possible to get a copy of 'Vidhyarthigale Ithile Ithile' nowadays! ?